performance – Page 2 – Java, SQL and jOOQ. 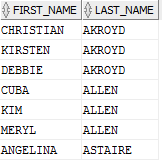 Probably the most impactful thing you could learn about when writing efficient SQL is indexing. A very close runner-up, however, is the fact that a lot of SQL clients demand tons of “unnecessary, mandatory work” from the database. Nothing out of the ordinary. 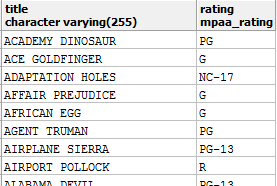 We run a movie database (e.g. the Sakila database) and we want to display the title and rating of each film to the user. Yes, we discard most of this information. The work that was performed to retrieve it was completely unnecessary. Right? Agreed. Sure, the individual execution time doesn’t really change much. Perhaps, it’ll be 1.5x slower, but we can handle that right? For the sake of convenience? Sometimes that’s true. But if you’re sacrificing performance for convenience every time, things add up. We’re no longer talking about performance (speed of individual queries), but throughput (system response time), and that’s when stuff gets really hairy and tough to fix. When you stop being able to scale. Most databases these days have figured out the concept of covering indexes. A covering index is not a special index per se. But it can turn into a “special index” for a given query, either “accidentally,” or by design. We could now eliminate the table access entirely, because there’s an index that covers all the needs of our query… a covering index. Does it matter? Absolutely! This approach can speed up some of your queries by an order of magnitude (or slow them down by an order of magnitude when your index stops being covering after a change). Note, the actor table only has 4 columns, so the difference between statements 1 and 2 is not too impressive, but still significant. Note also I’m using Oracle’s hints to force the optimiser to pick one or the other index for the query. Statement 3 clearly wins in this case. It’s a much better query, and that’s just an extremely simple query. Again, when we write SELECT *, we create needless, mandatory work for the database, which it cannot optimise. It won’t pick the covering index because that index has a bit more overhead than the LAST_NAME index that it did pick, and after all, it had to go to the table anyway to fetch the useless LAST_UPDATE column, for instance. This view just connects all the “to-one” relationships between a CUSTOMER and their different ADDRESS parts. Thanks, normalisation. Well, of course. 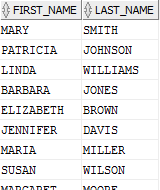 We run all these joins and full table scans, because that’s what we told the database to do. Fetch all this data. That’s a drastic improvement in the execution plan. Our joins were eliminated, because the optimiser could prove they were needless, so once it can prove this (and you don’t make the work mandatory by selecting *), it can remove the work and simply not do it. Why is that the case? Each CUSTOMER.ADDRESS_ID foreign key guarantees that there is exactly one ADDRESS.ADDRESS_ID primary key value, so the JOIN operation is guaranteed to be a to-one join which does not add rows nor remove rows. If we don’t even select rows or query rows, well, we don’t need to actually load the rows at all. Removing the JOIN provably won’t change the outcome of the query. But it doesn’t happen. The optimiser (or even the parser) can prove that any SELECT column expression in a EXISTS (SELECT ..) predicate will not change the outcome of a query, so there’s no need to evaluate it. Huh! One of most ORM’s most unfortunate problems is the fact that they make writing SELECT * queries so easy to write. In fact, HQL / JPQL for instance, proceeded to making it the default. You can even omit the SELECT clause entirely, because after all, you’re going to be fetching the entire entity, as declared, right? Vlad Mihalcea for instance, a Hibernate expert and Hibernate Developer advocate recommends you use queries almost every time you’re sure you don’t want to persist any modifications after fetching. ORMs make it easy to solve the object graph persistence problem. Note: Persistence. The idea of actually modifying the object graph and persisting the modifications is inherent. But if you don’t intend to do that, why bother fetching the entity? Why not write a query? Let’s be very clear: From a performance perspective, writing a query tailored to the exact use-case you’re solving is always going to outperform any other option. You may not care because your data set is small and it doesn’t matter. Fine. But eventually, you’ll need to scale and re-designing your applications to favour a query language over imperative entity graph traversal will be quite hard. You’ll have other things to do. Some of the worst wastes of resources is when people run COUNT(*) queries when they simply want to check for existence. E.g. Did this user have any orders at all? Easy. If COUNT = 0: No orders. Otherwise: Yes, orders. It doesn’t take a rocket scientist to figure out that an actual existence predicate can stop looking for additional rows as soon as it found one. So, if the answer is “no orders”, then the speed will be comparable. If, however, the answer is “yes, orders”, then the answer might be drastically faster in the case where we do not calculate the exact count. Because we don’t care about the exact count. Yet, we told the database to calculate it (needless), and the database doesn’t know we’re discarding all results bigger than 1 (mandatory). I’ve blogged about this recently, and benchmarked the alternatives on different databases. Do check it out. This article stated the “obvious”. Don’t tell the database to perform needless, mandatory work. It’s needless because given your requirements, you knew that some specific piece of work did not need to be done. Yet, you tell the database to do it. It’s mandatory because the database has no way to prove it’s needless. This information is contained only in the client, which is inaccessible to the server. So, the database has to do it. This article talked about SELECT *, mostly, because that’s such an easy target. But this isn’t about databases only. This is about any distributed algorithm where a client instructs a server to perform needless, mandatory work. How many N+1 problems does your average AngularJS application have, where the UI loops over service result A, calling service B many times, instead of batching all calls to B into a single call? It’s a recurrent pattern. The solution is always the same. The more information you give to the entity executing your command, the faster it can (in principle) execute such command. Write a better query. Every time. Your entire system will thank you for it.